This handbook pulls together the most reliable advice on fathering from such experts as Gary Smalley, John Trent, Ron Blue, Max Lucado, Larry Burkett, Les and Leslie Parrott, and Norm Wright. Concisely presented in a readable Q&A format. 479 pages, from Victor. 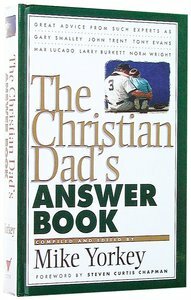 About "Christian Dads Answer Book the"